A federal court dealt a deadly blow to net neutrality on Tuesday by striking down the FCC's open Internet rules and practically inviting broadband providers to offer preferential treatment to companies willing to pay for it. It was a deadly blow, but did it really kill net neutrality dead? The future of net neutrality is a complicated one, muddled by politics and encumbered by its own troubled history. This week's ruling from the U.S. Court of Appeals in DC comes down to a technicality. Basically, if the FCC defined broadband service as a "common carrier" like telephone service, it would have the authority to impose the rules. Instead, broadband is considered an "information service," a category the FCC has no jurisdiction over. Changing that definition, however, is not an easy task as it bears fundamental implications on how the internet can and should be regulated. That's where the next step lies, and it's a fight worth fighting. Letting this latest ruling stand would change the most basic way business works on the internet, shifting companies' priorities away from innovation and towards back room deals. So even though the future of net neutrality is complicated, the future without it is downright grim. If you haven't been following the debate, you might be wondering: What's the big freaking deal with net neutrality anyway? What's it matter? Put simply, net neutrality refers to the basic principle that all data should be treated equally. That means no preferential treatment to specific kinds of content, certain users, individual companies, or modes of communication. Net neutrality advocates like to use the metaphor of cars on a highway, where cars represent internet traffic and the road represents the network. Left alone (read: neutral) any vehicle can zoom down whichever lane on the highway it wants without interference so long as the lane is open. But what if someone built fast lanes where only certain types of cars were allowed to travel? And what if someone toll booths along the road that already exists, just so that other cars had to pay extra to use the road? What if some cars were kicked off the road completely? It's impossible to predict the future but the consequences of a non-neutral internet have already started seeping out into reality. Comcast has already been trying to ensure that its streaming service doesn't have to play by its own bandwidth cap rules. Now imagine if it was also throttling Netflix bandwidth too. Or charging extra for that. Now imagine Time Warner is getting in on the fun—and then literally everyone else with access to the internet's pipes and skin in the game. It'd be a real mess. This is what a world without net neutrality could look like. Tuesday's decision invites big telecom companies like Time Warner and Verizon, who originally brought the case against the FCC, to charge companies faster speeds that get passed on to the end-user. (Those are the fast lanes and the toll booths.) This would effectively give an advantage to big internet companies who are willing to make deals with broadband providers and quite obviously presents small companies with the disadvantage of operating on a slower network. Inevitably, a world without net neutrality wouldn't reward the most innovative website with the best services but rather the companies that are best at making deals, or the companies with the most money. 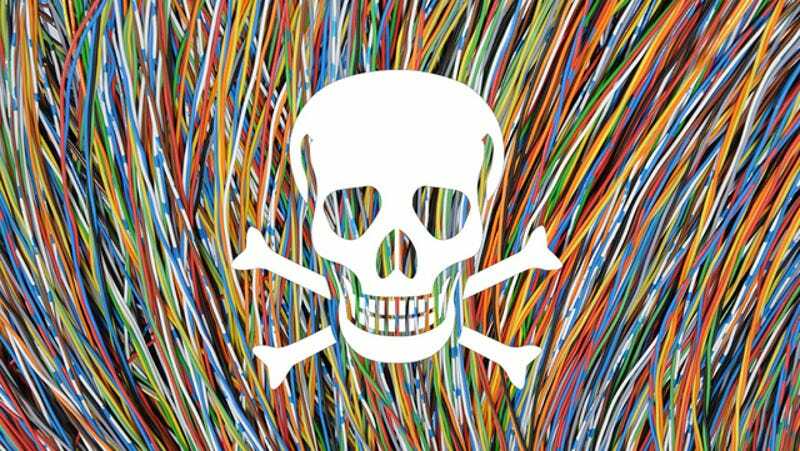 Getting rid of net neutrality boils down to a couple serious consequences for consumers. It would stifle innovation, for one. Small companies wouldn't just have to worry about winning over consumers with a good idea; they'd also have to figure out how to pay so that consumers could access it. Those costs could also trickle down to the consumer. Maybe you sign up for basic internet service but then have to pay an extra fee to access your favorite sites. Do you really want an internet with crappier services that will cost more money? Of course not. It doesn't have to be this way. And quite frankly, the internet has succeeding pretty spectacularly in its existing neutral state. To guarantee the future of net neutrality will take some work, though. At this stage in the game, it looks like the only thing the FCC can do is change how it defines of broadband internet. Rather than treat the internet as an information service as it currently does, it would have to classify it as a common carrier service, like conventional telephone lines. Republicans don't like this idea because they think it'll subject the internet to all kinds of new regulations. As such, former FCC chairman Julius Genachowski decided not to do this during his tenure but left the door open for current chairman Tom Wheeler to make his own call. Wheeler, for one, seems committed to preserving net neutrality. "Public policy should protect the great driving force of the open Internet: how it allows innovation without permission," Wheeler said last week, ahead of the federal court ruling. "This is why it is essential that the FCC continue to maintain an open Internet and maintain the legal ability to intervene promptly and effectively in the event of aggravated circumstances." Wheeler followed up after Tuesday's ruling with another encouraging statement. "I am committed to maintaining our networks as engines for economic growth, test beds for innovative services and products, and channels for all forms of speech protected by the First Amendment," he said. "We will consider all available options, including those for appeal, to ensure that these networks on which the Internet depends continue to provide a free and open platform for innovation and expression, and operate in the interest of all Americans." At the end of the day, it's worth remembering that net neutrality was a part of President Obama's platform way back in 2008. While the commander-in-chief has largely stayed out of the battle thus far, who knows what could happen if he decides to get directly involved. After all, when it comes down to legacy, the last thing Obama wants to be known for is destroying the internet.